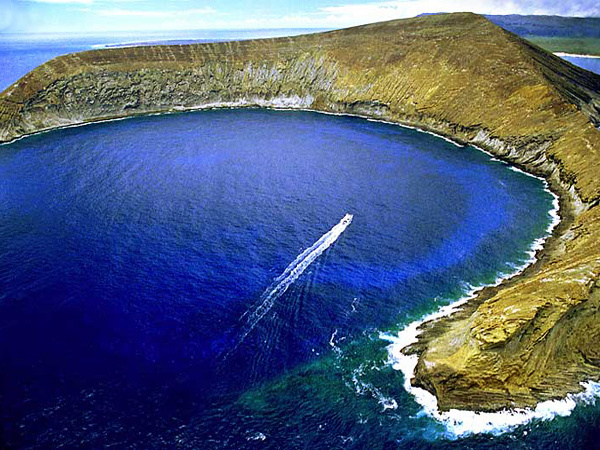 This is the Ultimate Hawaii Snorkeling Adventure Tour departing daily from Port Allen Harbor. This premiere Hawaii Snorkeling trip with HoloHolo Charters onboard a 65-foot power catamaran begins with a continental breakfast as we head west and north to the beautiful NaPali coast. The NaPali Coast is well known for its wonderful waterfalls, amazing valleys, and sea caves. 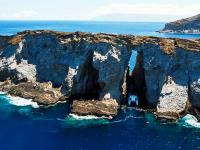 After Holoholo Charters shows you the sights and tells you about the history of the coast, we head across the channel to the " Forbidden Island " of Ni'ihau. When arriving at Ni'ihau, we'll take a few moments to choose a Kauai snorkeling spot. 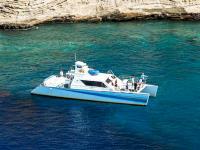 Our helpful Holoholo Charters crew will assist and instruct you on snorkeling in Kauai. In no time at all you'll be relaxing, floating, and watching the comings and goings of the aquatic world. Ni'ihau's great age means it has been shaped and carved by ocean currents and waves for longer than any other major island in the state. No other place in Hawaii offers such unique marine formations. Join Holoholo Charters for some of the best Hawaii snorkeling as you experience snorkeling in Kauai. After Kauai snorkeling, you will be treated to a gourmet deli-style buffet lunch. You can choose from a variety of deli meats, cheeses, veggies and breads to make your sandwich work of art. Also included are pasta, potato salad and fresh fruits. While you're eating we will talk to you, telling more stories about the island, the people and the history of Ni'ihau. Assorted soft drinks are served throughout the snorkeling in Kauai tour. Beer and wine are served after your snorkeling in Kauai experience. Don't miss out on Hawaii snorkeling on your Hawaii vacation. 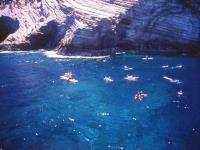 Reserve Hawaii snorkeling tours with Kauai Snorkeling and save money! Snorkeling in Kauai is a popular Kauai activity. Reserve your Holoholo Charters Kauai snorkeling adventure today! Check in at 6:00 am. Returns at 1:30 - 2:00 pm. Please wear your swimsuit on this Hawaii snorkeling tour. Please bring a towel, sunscreen and a camera for snorkeling in Kauai. The Holo Holo is a 65-foot power catamaran and Kauai's fastest tour vessel. She can carry 65 passengers, but this tour is limited to 45 passengers or less, which means more room to sightsee and relax. Built with safety and comfort in mind, Holo Holos design is wide enough to eliminate any long, side-to-side rolling motion. The hulls are narrow to slice easily through the water, resulting in a smooth ride. The Holo Holo is equipped with two heads (bathrooms) located on deck (no need to climb or descend a ladder to use the facilities), with ample room to change into your bathing suit in privacy. Holo Holo also boasts a huge shaded cabin with windows that open to allow fresh ocean breezes.